Earlier this month, I moderated “The Politics of Gentrification and Displacement, from Portland, Oregon, to St. Louis, Missouri,” a panel at the St. Louis International Film Festival (SLIFF). The panel screened two films. The first, Displaced and Erased (2016), is a short feature (which you can watch here) about the mid-20th century displacement of a thriving black community from what is now downtown Clayton, MO. Where there used to be black homes, churches, and schools, there are now four-star business hotels, restaurants, and parking garages that cater to mostly white clientele. These changes came because officials in Clayton, the St. Louis County suburb adjacent to St. Louis City, systematically implemented policies to displace black people, by erasing black homes and gathering spaces. Emma Riley, a white filmmaker who was born and raised in Clayton, directed and produced the film after learning about the displacement from her black high school teachers. 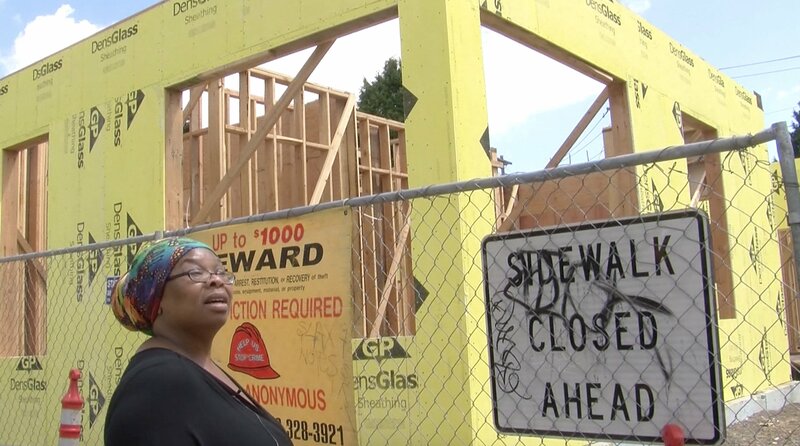 Scenes from Priced Out: Nikki Williams in 2013, when she realized that the black community in her neighborhood had been “obliterated” by gentrification. Image from pricedoutmovie.com. Both films poignantly depict how the particular processes that displace and erase marginalized communities–and in these cases processes that displace black people and black neighborhoods–contribute to logics that naturalize gentrification. Priced Out also particularly shows the how the aesthetics and young, white demographics of gentrifying coffee shops (and I’m thinking about the recent controversy in Denver with its “happily gentrifying” coffee shop) and apartments act as violent signifiers to long-term, often non-white residents—who often also being displaced by huge rent hikes—that they are no longer welcome in their neighborhood. The social status of many residential areas is being ‘uplifted’ as the middle class—or the ‘gentry’—moved into working-class space, taking up residence, opening businesses, and lobbying for infrastructure improvements. There has been a great deal of displacement. All those who cannot hold their own—the small enterprises, the lower ranks of people, the odd men out—are being pushed away. Since Glass coined the term, gentrification has been used by scholars to capture a set of processes that produce a pernicious type of neighborhood change. In his 1996 book, The New Urban Frontier: Gentrification and the revanchist City, Marxist geographer Neil Smith defines it as a “process … by which poor and working-class neighborhoods in the inner city are refurbished via an influx of private capital and middle-class homebuyers and renters—neighborhoods that had previously experienced disinvestment and a middle-class exodus” (30). Gentrification as a process is almost always associated with racialization and displacement. As such, it follows broader genealogies of geographic and urban change in the United States that relied upon policy to produce those racialzied changes. These include the westward settling of the frontier, which relied upon legislation to mark Native American lands as an empty in states like Oregon, which, as Priced Out documented, also used policy, specifically black exclusion laws, to prevent black settlers. This includes redlining efforts that not only racially segregated neighborhoods, but that also produced wealth for white homeowners, and dispossession for black residents. And this includes displacement of black people and destruction of often black neighborhoods: not just downtown Clayton, but also in St. Louis Mill Creek Valley in the 1950s, Pruitt-Igoe in the 1970s, Laclede Town in the 1980s, and most recently St. Louis Place where in 2017, 212 black homeowners were displaced for the new NGA site. While moderating, I asked our panelists (Priced Out director Cornelius Swart, as well as Peter Benson and Kedron Thomas, both professors of anthropology at Washington University): what can we do? What can we do to prevent displacement and produce more equitable cities? Actions by activists captured in Priced Out suggested some solutions: ending no fault evictions (which are currently legal in Oregon), implementing rent control, enforcing affordable housing provisions in tax incentives (often ignored by developers), and giving those displaced a first “right to return” to newer developments. Cornelius Swart also floated the idea that displaced residents, especially those displaced by city practices meant solely to extract profit, should sue the city. I felt much more hopeless a month earlier while an attendee at “We Lived Here!” An October 2017 panel at the installation Eminent Domain/Displaced at the Griot Museum in St. Louis (more on this in a following post), “We Lived Here! : A Community Panel” featured residents from St. Louis and Kansas City displaced by practices of eminent domain including Ameena Powell, Sheila Rendon, Charlesetta Taylor, Ruth Marie Johnson Edmonds, Vivian Gibson, and Patricia Lee. 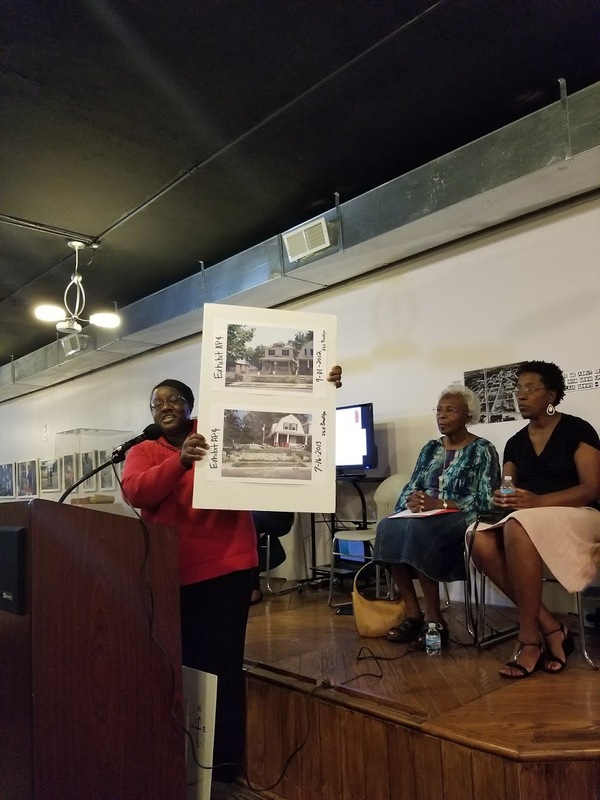 All residents on the panel were black women; some had been displaced multiple times from both Mill Creek Valley, the thriving black community in St. Louis demolished in the early 1950s, and more recently in 2017 from St. Louis Place, the mostly black neighborhood in North St. Louis City, of which city officials seized 97 acres by eminent domain for the National Geospatial Agency (NGA). My home was taken for the NGA Project. We fought hard. We understood probably in the 1970s, there was a move against our neighborhood. We saw businesses leaving, we saw institutions closing, we saw offers being made to homeowners to buy their living costs to leave the neighborhood. Within about 1998, there was the last of the residents here and there was an active move from several businesses to buy up our neighborhood. But we still wanted to reach out to these entities thinking that there was a development coming that would include us. We understood in roughly about 2007 that the neighborhood was being taken, finally taken. Not developed. My house was built in 1865, and the blight study read that our property was outdated, an eyesore, unsafe, unsanitary. Which none of those things were true. We found that the city had used whatever tactic in order to take your home. The blight study led to condemnation. Condemnation opens the door for eminent domain. By the time we were aware that our properties had been audited, eminent domain was just inevitable. … Because our memories, our homes, our neighborhood, the people that we are, the people that we saw every day, mattered not to the city. The city used us as a way to bring economic development and all they saw were dollar signs. They couldn’t care less about the fact that we had people in the neighborhood that were upwards of 75 and 80 years old, who had never lived in any other home in their adult life. They couldn’t care less about the fact that my children were in high school … they started since they were in kindergarten. So to the fight that is Mill Creek, St Louis Place, and others in the future, will be from the very beginning. When there is talk about the development of your communities, you have to be there from day one. Because development is not always for you, sometimes it’s against you, and the very last tool that they will use is eminent domain. So do not fear it, it’s not something that you should fear, it’s something that you fight. And you fight to the very, very end. My husband and I were the very last people in our community and we fought. My husband starved himself for 30 days on a public forum from the transition from winter to spring, sleeping in tents, the struggle was real. One thing I will leave you guys with, with the idea that, Mill Creek Valley happened and St Louis Place happened, is that it can happen to you and if you are not diligent, and you do not go to the meetings, if you do not confront your elected officials, it will happen to you. And you will be on the stage as we are today talking about what happened to our neighborhood. Don’t let that happen to you. Who was Wendell Phillips? Wendell Phillips was a white man, who was a court attorney, he was a writer, a poet, and he left a good law practice on the east coast, and he gave up that practice to become an abolitionist for slavery. And so that’s how our neighborhood got the name Wendell-Philips. Some of the famous people that lived in our neighborhood…. There was movie called the Great Debaters. It’s about a gentleman named Melvin Tolson and how he took the debate team all the way to national championships. … He grew up in the neighborhood. He graduated from Lincoln High School, which is still one of the top performing high schools in the country. Virgil Thomas [wa]s a Harvard graduate of music and … a composer. … Charlie Parker, the famous saxophonist, grew up in our neighborhood. About the community, like a lot of the people say about Mill Creek, this is a neighborhood where people lived and they stayed. So my grandmother bought her house in 1943, she had all her children out of that house. Her children now live in that house and they’re now in their 70s and 60s. And that house will be knocked [down] as well. So we’ve got 72 years of history, at least 72 years of history, in that one house. I bought my house in 2007. I was thirty years old. I paid $10,000 for that house. It was a fixer upper but I was proud to own a fixer upper. I came back from holiday and said, “This is where I want to spend the rest of my life.” So I paid for the property, and it was probably the most exciting day of my life. I got the notice in about 2011 that we were going to be displaced. Unlike a lot of the things that have happened to the people here, there was no planning for any of this. In our city, we have a city planning commission, and development has to go through the city planning commission before it can be implemented. So there has to be: these notices have to be posted. They weren’t. This is October 2013, we got our notices and were sued in court, well before this. Chapter 5.23 requires you to give notice to a homeowner before you partake or undertake an eminent domain action. And that just didn’t happen. … The powers that be will get their way regardless of how illegal, nefarious or … criminal it can be. They will get what they want and so in 2013 … the city, after I lost my appeal in court, the city decided, whoops, this is them. So when I filed my appeal in court, they wanted to go ahead and tear down the buildings. Now this house [next to Powell’s] had been vacant for months and they were supposed to be tearing down the houses in order of the sale. … But they tore mine down so they could have an argument in court to say that the building is torn down, you don’t really have anything to fight for. So that is my experience with eminent domain. At the very least we–those of us invested in building equitable neighborhoods and protecting those made vulnerable by destructive urbanization–can collect their voices and stories. The end of World War II saw large parts of Central European countries in ruin. The borders were changed after the Potsdam conference, leading to mass deportations and resettlement of millions of people. Vast areas of multi-ethnic borderlands that had been typical of the pre-World War II Eastern and Central Europe turned in most cases into monoethnic states. Cultural and national diversity, which had been the hallmark of what Hanna Arendt called “the belt of mixed populations”, albeit not without strife or conflict, virtually disappeared in most communist states, with the exception of Romania and the Yugoslavian federation. Landscape, always a palimpsest of human and natural layering in time, held traces of that erased presence of people exterminated during the war or evicted afterwards. The communist states began also the push toward modernization and collectivization, profoundly changing rural and urban landscapes. At the same time landscape became a crucial ideological arena for the communist state on which the successful story of human command of nature for the common good of the people was to be played out. As witness and active agent of key historical events such as uprisings, wars, burials and revivals, landscape was the repository of national history and memory, contributing an essential scenery for commemoration practices. Irreversible damage to natural resources done by heavy industry was covered up with the politics of conservationism and ecological responsibility. After the breakthrough of 1989, landscape was fundamentally transformed again by sweeping changes that affected the economy and created hybrid combinations of industrial and post-industrial urban space. Moreover, government was decentralized and the new freedom was used to construct new collective identities (a turn to regional forms of belonging, transborder solidarities and common histories and, at the same time, a weakening of centralised national affiliations). Likewise, privatization of space commodified landscape, challenging the sense of commonality in the experience of public space, while, on the other hand, civic thinking about ecology and environmental openness gained ground. We would like to invite scholars in the field of humanities and social sciences who will share their perspectives on the reordering of physical and social space in Central Europe after World War II and after the collapse of communism. The conference will be held in Wrocław, Poland, 19-21 September 2018. It is a joint venture between the European Academy of Science / Academia Europaea (Knowledge Hub, Wrocław) and the Faculty of Philology of the University of Wrocław. A selection of papers will be published. The conference is part of a series of symposia, which bring together established scholars with early career researchers, particularly from East Central Europe. APPLICATION: The registration is available at: www.acadeuro.wroclaw.pl. Submit a 300-word proposal, a curriculum vitae with a list of publications by 28 February, 2018. All applicants will be notified about the selection of participants before 30 April, 2018. REQUIREMENTS: Presenters are required to submit a 3,000-5,000 word description or excerpt (i.e., chapter, article, etc.) to be circulated among participants by 15 August, 2018. All workshop participants are asked to read these submissions prior to the workshop. The paper should be an unpublished one. Presenters who do not meet the submission deadline will not be able to present their work. THE SEMINAR LANGUAGE will be English. FINANCIAL ARRANGEMENTS: The organizers will cover the conference fee and the costs of accommodation (up to 4 nights), travel (up to a certain maximum: Western Europe – up to 100 EUR; Central and Eastern Europe – up to 150 EUR) and insurance. The Amazon-Race: Are we Edgy, Real, and Urban Enough for Jeff Bezos? 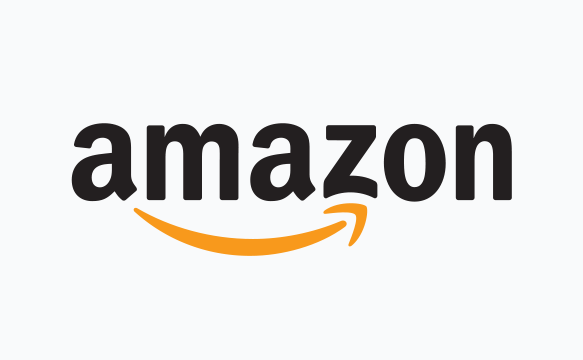 At the time of this writing, 238 cities have submitted official bids to Amazon in order to be considered for Amazon’s second headquarters, supplementing their base in Seattle. There is a long and ongoing debate within economic geography (and related fields) about the costs and benefits of such competitions for major corporate expansions and relocations. Literature can be found that is supportive of intra-urban competition, tax incentives, and boasts of the intangible economic multipliers and dividends that these companies can bring (sometimes academic, but often led by think-tanks and consultancies). More critical literature (from geographers such as David Harvey, and many others who have critiqued the neoliberal urban economy) questions whether awarding companies such as Amazon tax and other incentives really pays off, especially in addressing structural problems and societal injustices. To be fair, a nuanced exploration can find examples where incentives might be judged to have succeeded, and others where they have clearly failed. Regardless of this ongoing debate, one thing that is fascinating to me (and relatively unexplored) is the way that cities (and regions) present themselves during these processes, culminating in the 5-minute “bid videos” that are hand-crafted by local officials to showcase certain aspects that the courted company (in this case, Amazon), might find appealing. “Bid videos” are perhaps more famous when used for mega-events such as the Olympics, but are often featured in economic development efforts of the corporate type. For the viewer, they run the spectrum from inspiring to cringeworthy. Who is involved in these efforts, and what informs their worldviews? Why are certain subjects, images, themes, symbols, sounds, and text chosen – and what are the meanings (or attempted meanings) attached to them? Who ‘owns’ a city’s self-identity – and at what point is this agreed upon, or in a state of constant negotiation and formation, what are the competing conceptions of identity? Where are the misunderstandings and disconnects between what local groups ‘think’ a company like Amazon wants, and what Amazon’s decision makers are really looking for? To what degree do notions of ‘cultural capital’ and ‘habitus’ (referring to Bourdieu) deliberately or non-deliberately enter these processes; the subtle spoken and unspoken cues and clues meant to reach and connect with certain audiences? What power relationships, power geometries, and uneven / exploitative structures are reinforced, questioned, or challenged in these efforts and marketing materials? Are there opportunities for subversions; for resistances; for progressive transformations – or must this be an (and caught within) inherently unjust neoliberal process / processes? I link here (below) two similar, and yet so different, videos in the AMAZON-RACE: Charlotte’s (cringeworthy) effort to be seen as an edgy, hip, urban Millennial hotspot (count how many times the word “millennial” is mentioned in the video) and Detroit’s (somewhat more inspirational) showcase of its unique identity. Both, interestingly, are written / performed in “spoken word” – the urban poetry form that is often associated with contemporary intellectual African-American-hipster communities. For Detroit, a city that has been majority African-American for decades, and is a national and international center of African-American music, culture and history – this representation seems somewhat natural (even given Amazon’s relative whiteness, coming from Seattle, a city in the least African-American part of the country). For Charlotte, however, there is a bigger question mark: is it to appease Pacific Northwesterners who might be wary of lasting racial attitudes in a Southern city? An effort to seem culturally relevant, offering the sort of culture that so-called Millennials are deemed to want and crave? Or a badly-disguised and unapologetic appropriation of an urban African-American art form for a corporate relocation largely planned by and benefiting affluent whites? Or, is it simply an example of what local critics have previously called Charlotte’s “Pinocchio” syndrome – the incessant need to say, “look, papa, I’m a REAL city! ?” (with “Papa” in this case being Jeff Bezos, the world’s richest man). Perhaps these conclusions are best left to the eye and interpretation of the viewer, or a researcher interested in further exploring these questions. And the conclusions may be informed by whichever city Amazon picks, if indeed, their exercise is not just illusory.